The CASE Construction King range of backhoe loaders delivers a powerful performance and exceptional economy. The Tier 4 Final compliant engines, automatic ride control system, fast backhoe boom positioning and a choice of transmissions result in low fuel consumption and emissions, high operator comfort, breakout force and great lift capacity. A wide range of buckets and attachments is available and you will find it very easy to change them with the integrated hydraulic backhoe quick-coupler. Our engines are used not only in earthmoving equipment but also in trucks, agricultural equipment, marine and military applications. The air intake system with centrifugal dust separator reduces the cleaning intervals. 16 valves allows perfect air intake management, higher turbolence and consequently optimal combustion. High turbulence piston and air intake manifold. High pressure multi-injection common rail for a perfect air-fuel mix and greater burning efficiency. Electronically controlled “waste-gate” valve for immediate engine reaction and shorter lag time before the turbo begins to spool and generate a boost. The integrated engine and after treatment system management always provide the highest power with the lowest fuel consumption, whatever the climate conditions or engine load. Viscous fan: no power is wasted with its low cooling demands. Oil and filter check points are easily accessible on the left side of the bonnet. The front opening provides the operator with a full view of the engine components. The anti bumping frame surrounding the radiators prevents damage if the machine hits an obstacle at speeds up to 5 km/h, reducing extraordinary maintenance costs due to cracks in the radiators. The externally installed SCR eases the access to the after-treatment components, while ensuring a wider space under the bonnet to be used for routine maintenance. The exclusive outer extendahoe is part of the CASE DNA: all the components in contact with the soil are protected against impact and material accumulation. The gripper teeth provide perfect material retention especially when working on pipe placement. The curved main boom provides greater digging ability and makes it easier to load a truck. Pilot controls automatically deactivate when not in use for improved safety. They are immediately reactivated at the touch of a switch. We don’t like wasting time and fuel, and we know you don’t either, so we significantly reduced transport height with the overlapping cylinder geometry. The 580ST measures less than 3.5 m in height, while the 590ST and the 695ST measure less than 3.7 m.
Do it from the cab! The patented integrated hydraulic quick coupler enables the operator to change over the backhoe attachments from the cab, with a simple switch. The hydraulic side shift allows easy and quick backhoe replacement in all working conditions. The new Universal coupler allows to install on Backhoe boom, not only traditional CASE buckets, but also the most common buckets of the main backhoe manufacturers. This solution allows the customer to have multiple choices and to fit buckets alredy present on his yard. The universal couple is optional for in-line geometry backhoe design. CASE has enriched the offering by introducing a new backhoe design with “In-Line” cylinder geometry and inner extendahoe. The new solution allows the customer to choose the best technology for his own needs. A different solution to lead the market with top performances, comparable with well known CASE DNA characteristics. The aligned cylinders ensure perfect visibility across the boom and reduce the structure, better distributing the stress. This is the typical solution adopted on large excavators where productivity and reliability are a must. The new technology will flank the well known and more backhoe oriented CASE DNA boom with overlapping cylinders and outer extendahoe. Auto Ride Control reduces loader arm bouncing during travel, maintaining maximum material retention on all surfaces, for higher travel speeds and reduced journey times. The system offers a choice of 3 settings to match customer preferences or different soil conditions. The front axle offers +/-11 degrees of oscillation, to maintain traction on the toughest terrain, improve bucket retention and maintain high productivity. Different tyre designs (from industrial to agricultural) and technologies (radial or bias) are available to meet the different requirements for traction or resistance to impact and stress. The job has never been so easy! Curved front loader arms improve truck loading while mechanical self-levelling assists the operator. Return-to-dig function significantly reduces operator effort on repetitive loading operations and speeds up the whole cycle. Excellent front loader visibility and the mechanical self-levelling feature make loading and unloading pallets simple. For the professionals requiring very high tipping height or for those working mainly with the backhoe, the Straight Loader Arm is the preferred solution. The arm design makes the loader structure less complex, minimizing the greasing points and providing higher visibility on the front of the machine. The straight and long arms have the loader pin point 8 cm higher than standard bent arms without affecting the breakout and loading performance which are aligned with the more “traditional” solution. The anti-tipping function keeps the bucket on the correct position while lifting the load, consequently there is no risk of material spillage. 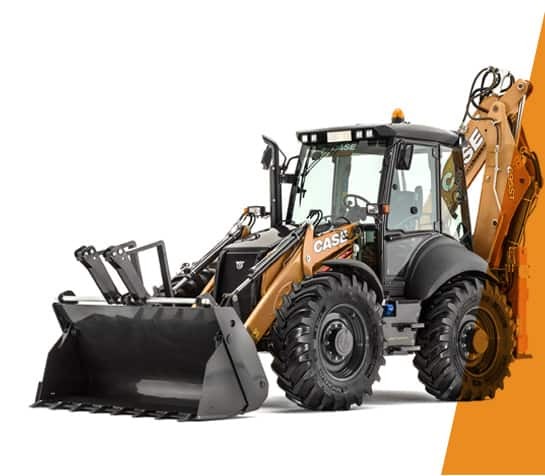 See how your favorite CASE Backhoe Loaders compare. Configure your perfect CASE Backhoe Loaders today.